Hibs are back in Ladbrokes Premiership action tonight (7.45pm kick-off) with Rangers the visitors to Easter Road. Paul Heckingbottom’s team will be looking to bounce back after last weekend’s disappointing Scottish Cup loss to Celtic, but remain unbeaten in the league under the new head coach. A victory tonight would put the Hibees above Hearts in the Scottish Premiership table thanks to goal difference, at least until the Jambos play Dundee tomorrow afternoon. Hibs are unbeaten in their past four league meetings with Rangers (won one, drawn three) since a 1-2 home defeat in December 2017. The Easter Road side are the only Scottish opponent yet to lose against Steven Gerrard’s Rangers, having drawn twice with the Light Blues this season - once at home, and once at Ibrox. However, the Gers will be a stern test and are unbeaten in 10 games in all competitions (won seven, drawn three), keeping a clean sheet in seven of those games. Lithuanian midfielder Vykintas Slivka is suspended for the visit of Rangers after his red card against St Johnstone but Stephane Omeonga could retain his place in the starting line-up. Stevie Mallan could be restored to the team after starting on the bench against Celtic. Despite Hibs’ recent league record, Rangers are odds-on favourites with the bookies to win tonight, no doubt a reflection of the firepower the Ibrox outfit possess. The volatile Alfredo Morelos, with 28 goals in all competitions, is an obvious threat, but there’s plenty of danger from elsewhere, with James Tavernier – largely thanks to his prowess from the penalty spot – have scored 14 times, while the likes of new arrival Jermain Defoe, Scott Arfield, Daniel Candeias, Ryan Kent and Kyle Lafferty have also made a contribution on that front. Nine goals in their previous two league games highlight just why Rangers have scored 64 goals but their defensive record is just as impressive. Aberdeen striker Sam Cosgrove’s penalty in last weekend’s Scottish Cup tie was the first Rangers had conceded in six matches and in the league only 20 have been lost. However, Hibs have already drawn home and away against them this season and another point would be welcome. Hibs: Defender Ryan Porteous and winger Martin Boyle are out for the remainder of the season with knee injuries. Creative midfielder Ryan Gauld also misses out with a hamstring strain, while utility man Steven Whittaker (groin) and Thomas Agyepong (hamstring) are still unavailable. Vykintas Slivka serves a one-match ban after the midfielder’s red card in Perth last time out. Rangers: Long-term midfield absentees Graham Dorrans and Jamie Murphy are still out, and are joined by winger Eros Grezda, midfielder Matt Polster and veteran defender Gareth McAuley on the sidelines. Rangers: A McGregor, Tavernier, Goldson, Worrall, Barisic, Jack, Kamara, Candeias, Arfield, Kent, Morelos. Subs from: Foderingham, Katic, Flanagan, Wallace, McCrorie, Halliday, Davis, Middleton, Coulibaly, Defoe, Lafferty. Hibs are unbeaten in four matches against Rangers. Pick one of Lewis Stevenson v Daniel Candeias, or David Gray v Ryan Kent. Alfredo Morelos is an obvious threat but the two widemen will be looking to support the Colombian and both full-backs could be in for a busy night. Daryl Horgan leads Hibs in crosses (54) and will be looking to ping in a few more this evening. Rangers have scored 39 goals in the first half of their league games this season, more than any other Premiership side, with 10 of their past 13 such goals coming in the opening 45 minutes. Hibs have won all three of their Scottish Premiership games under Paul Heckingbottom and are looking to win four in succession for the first time since September-October 2018. Steven McLean is the man in the middle this evening - he’s got previous in this clash, having been handed the whistle for the 2016 Scottish Cup final between the two sides. 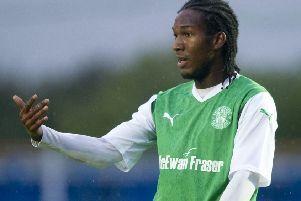 Hibs fans will be fervently hoping his presence is a good omen. He is assisted by Graham Chambers and Stuart Stevenson while Bobby Madden is the fourth official.